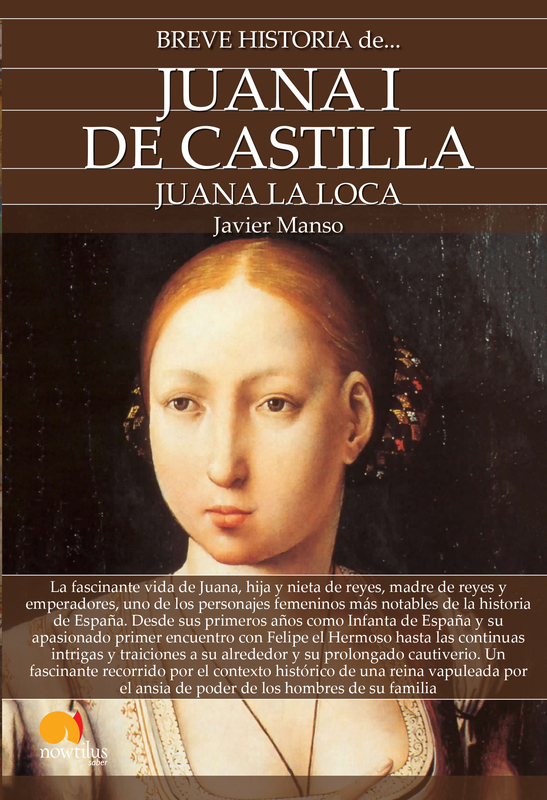 Juana la Loca es uno de los personajes más singulares y perturbadores de nuestra Historia. Le tocó ser protagonista, muy a su pesar, en una época convulsa aunque determinante para el futuro. Pero sobre todo fue una víctima: víctima del ansia de poder de los hombres que gobernaron la España más poderosa de todos los tiempos, y también víctima de una profunda depresión causada por el desprecio, la soledad, los celos y finalmente la muerte de su amado esposo. Javier Manso Osuna es licenciado en Filología Hispánica y especialista en Literatura Española. Ha publicado numerosas biografías de personajes históricos (Isabel la Católica, Miguel de Cervantes, El Greco, Santa Teresa de Jesús). En la actualidad trabaja en el mundo editorial. The amazing life of one of the most notable female characters in history. The last monarch of the Trastámara dynasty, the daughter and granddaughter of Kings, mother of Kings and emperors, who was the victim in a world of powerful men, and could never prevail. A fascinating journey through the historical context of a Queen savaged by the lust for power, love, jealousy and death. Joanna the Mad is one of the most unique, and disturbing characters of the spanish history. She had to be protagonist, much to her regret, in a turbulent period, but at the same time decisive for the future. Above all she was a victim: victim of the lust for power of men, who ruled the most powerful Spain in history, as well as victim of a deep depression caused by contempt, loneliness, jealousy, and finally, the death of her beloved spouse. She lived for many years for what was customary at the time, which is surprising if we take into account the strange circumstances surrounding her existence, and unique facts that she starred in: she brought forth nothing less than six children, she made long and arduous journeys in her youth, she had many periods of true mental derangement, in which she mistreated her body, and spirit, and above all was held during her almost last fifty years in a Palace in the cold city of Tordesillas, not always in the best conditions. Daughter and granddaughter of Kings, mother of Kings and emperors, devoted herself to be a powerful Queen, she did not actually govern, not even for a day. This is the story of a woman who might have had the world at her feet, but did not even found herself in her long life. Javier Manso Osuna holds a Master’s Degree in Spanish Philology and is specialised in Spanish literature. He has published numerous biographies of historical characters (Isabella I, Miguel de Cervantes, El Greco, Saint Teresa of Ávila). He currently works in the publishing world. - A divulgative essay on the most significant events in the history of Spain, and Europe, through the figure of Joanna I of Castile, a Queen who helped set the foundations of the modern Spain, Spanish monarch of the Trastámara dynasty. - This work goes beyond the simple story that we know providing the academic vision of the historical figure. - This title explains historical events of great importance; the expansion of Spain, the possession of the Kingdom of Castile, the revolt of the Comuneros. It will also establish the reason behind political decisions; the politics of dynastic marriages that was undertaken at the moment, and also important aspects of her biography; the Regency, her long captivity, and the death of her husband Philip). - This book demystifies the most widespread ideas on Juana to publicize a woman who was strong, patriotic, and able to make good decisions for her nation. Discover the facts about her life which will allow the reader to have a much more complete, and successful vision. - The work contains more than 60 graphic elements (pictures, paintings, illustrations) that support the educational work of this monograph. - Javier Manso Osuna holds a Master’s Degree in Spanish Philology, and is specialised in Spanish literature. He has published numerous biographies of historical characters (Isabella I, Miguel de Cervantes, El Greco, Saint Teresa of Ávila). He currently works in the publishing world. La sorprendente vida de la última monarca de la dinastía Trastámara, hija y nieta de reyes, madre de reyes y emperadores, que fue víctima de un mundo de hombres poderosos y que nunca pudo reinar. Un fascinante recorrido por el contexto histórico de una reina vapuleada por el ansia de poder, los celos y la muerte.